An Eagle’s Eye on Student Employment | BANG. College campuses are well-oiled machines. From dining halls to gyms, accommodating the schedules of thousands of students and staff every day is no small feat. Luckily, students who work on-campus jobs help to keep the system running smoothly. From those who tirelessly prepare Addie’s flatbreads late into the night to the team that converts Conte Forum from one style arena to another in a few short hours, these individuals are all uniquely crucial to the functioning of BC’s campus. In addition to their jobs, BC student employees must also strategically juggle classwork, sleep, and a social life, same as their peers do. We talked to some BC student employees to learn more about how they manage their scheduled shifts and to explore the details of their positions that don’t always find their way onto the job description. What’s the busiest shift in CoRo Cafe? The busiest shift is definitely the midday shift, so from 12-6 pm it stays pretty busy. Also, when Mac doesn’t have the greatest food there is definitely a spike in the amount of people who come in to order a pizza or mac and cheese. What’s your best coworker story? I don’t have a specific one, but just talking when there’s a little bit of down time and laughing about accidents that happened. Some kind of milk is always being spilled and the coffee containers always end up not being closed, so there’s always those fun spills. How do you allow your classes and job to coexist? What adjustments, if any, have you had to make? We pick shifts at the beginning of every semester so we know what our classes are by that time and you just try to find the shifts that work best for you. The managers make a spreadsheet with all the available shifts and you pick one or two that work with your schedule for that semester. What’s an underrated menu item you would suggest people try? I love making the Passion Tea Lemonade with raspberry pumps, it’s super refreshing. And when I’m in the mood for something hot but also not coffee I make myself a white hot chocolate with vanilla pumps, it’s so good! What are your responsibilities in this position? I work with Julianne Stelmaszyk, Manager of Regional and Sustainable Food Systems, and other student interns on sustainable food sourcing, improving dining hall policy related to sustainability, and promoting eco-friendly eating habits among BC students. I’ve specifically been working on researching strategies for waste reduction in the dining halls. I also do a lot of collaboration with environmental groups on campus related to dining projects. Were you interested in or particularly passionate about sustainability prior to obtaining this position? How did you find it? Environmental advocacy has been important to me since high school. 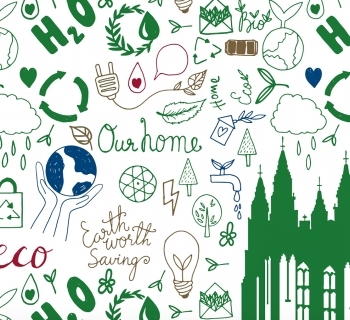 I was a part of my school’s Environmental Action Group for four years. I knew starting college that I wanted to major in Environmental Studies and I got involved with both EcoPledge and BC’s food justice group, Real Food. I learned about the Dining Sustainability intern position because I worked on a project for EcoPledge last semester related to waste reduction. During the project I collaborated with a few interns and realized it could be a great job for me! What’s something new that you’ve learned/realized about BC Dining? 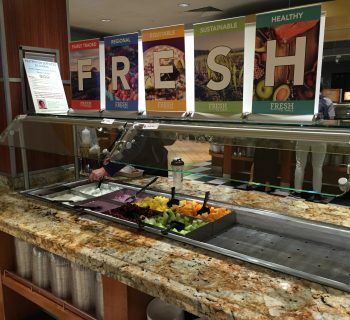 I’ve realized that there is a lot that goes into every decision that BC Dining makes. It’s easy to want to blame Dining for problems that students see on their end, especially when it comes to sustainability, but there’s so much going on that we don’t see. I’ve had to become a little less idealistic about my goals for sustainability and really think about the practical application and the complexities of the problems we’re trying to solve. How do you divide time between homework/social events and a work schedule? I definitely feel busy balancing my work with everything else in my life. I work a few hours in the office every week, but get to plan my meetings and get work done remotely based on my own schedule. I’ve learned to be more efficient with my classwork this semester, which is honestly pretty helpful. I was also involved in environmental action on campus even before I got the job, so often my environmentally-focused extracurricular activities help make my work as an intern easier, and vice versa. What’s the best part of a mailroom job? The best part of the mailroom job is getting to know the workers there and seeing the behind the scenes of the deliveries. I have even gotten to know some of the delivery drivers who come to drop off packages every week and the people who work in the mailroom are the nicest people! Last semester I worked with a girl who is super cool. I really looked up to her. One time we were talking and I found out she was a singer-songwriter. I’m also very interested in music, so we’d just talk and listen to good music and it was really great! I know that may not be the most exciting coworker story, but it was a lot of fun! There have also been some times this semester when a coworker and I were goofing around or laughing hysterically and it was really awesome. The mailroom is just a lot of fun all-around. Have you ever had an experience that made you want to quit? How did you handle it? I have been fortunate to not have had an experience that made me want to quit. Sometimes I may get frustrated during my shift but everyday is a new day! How do you choose shifts? Are they assigned or do you do the same time slots according to class schedule each semester? At the beginning of each semester, you email the boss with times you will be able to work and he tries to assign everyone. If your timeslots end up not working, you can drop them and pick up open shifts that work in your schedule. What’s one of the best-kept secrets in terms of food at Hillside? Not many people know about the half sandwich, half soup offer, which is a great budget option at Hillside. Also, if you don't want a hashbrown with your omelette or chips with your sandwich or panini, you can switch it for fruit. 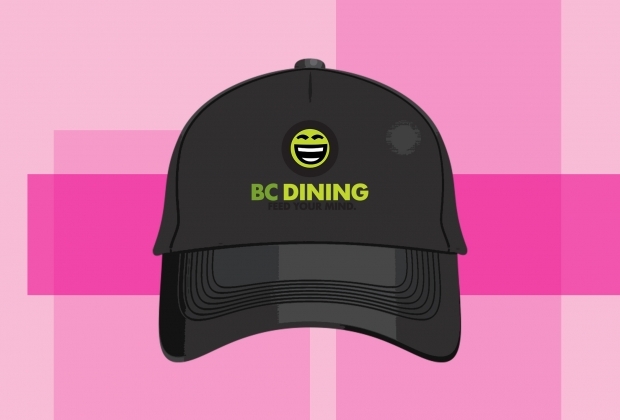 Have you gotten to know any of the non-student BC Dining employees better through your job? I love all the non-student workers. Everyone at Hillside is so lovely and has genuinely made me feel very at home. As an international exchange student, working at Hillside has really provided me with a warm community and being around non-students is a small way of getting out of the BC bubble without having to go anywhere! One of my best friends here isn’t a student, which I love because it reminds me that there is life away from college and it helps put everything into perspective when assignments feel like the be-all and end-all. Do you find it difficult to balance your workload with your job? What's a strategy you use to manage them both? It can be difficult to balance work and my job and everything else I want to do. Sometimes four hours working at Hillside can seem like a lot of time to commit, and I might finish my classes for the day, go to Hillside and know that I'm not going to be studying until very late, if at all. But honestly, I look forward to seeing everyone at Hillside. The community provides the incentive for me to go into work. I look forward to catching up with co-workers, seeing the regular customers, and having random chats with whoever asks where my accent is from! I've found I really enjoy customer service and, with the skills I've learned here, have been able to get a job in a cafe in my hometown in England for the summer. What’s your favorite meal/item to buy at Hillside? I love the Mediterranean Hummus sandwich and the Red Lentil and Zucchini soup. Best combo! Also the Nature's Way and Fruitopia bagels are delicious. And everyone knows Hillside cookies are the best! Not all heroes wear capes. Some sport black CoRo Cafe visors and others wield barcode scanners. It is thanks to these students, and the staff members alongside them, that each of the many functions on BC’s campus are up and running on a regular basis. Aware of the balancing act which students have to perform in order to complete their classwork and hold a job, managers are generally very understanding when it comes to scheduling shifts and prioritizing grades. Additionally, employees often enjoy strong relationships with their coworkers, who can be of any age and experience level. Student employment is not only financially rewarding, but a social experience in and of itself as well as a way to become more deeply involved with the school. Who said work and play had to be completely separate?